The power plant of human cell is called the "mitochondrion." The mitochondrion is what generates energy for the cell to use. What everyone refers to as "energy" is derived from the oxidative reduction of the cellular respiration. This is done through the mitochondria. But the problem arises when the cell is low in magnesium, relative to calcium. Adenosine triphosphate, the "energy currency"
of the cell, is magnesium dependent. This means it is obvious that the calcium pump at the cell membrane is also magnesium dependent. Without enough "biologically available" magnesium, the cellular calcium pump slows down. Thus a vicious cycle is established. The low levels of available magnesium inhibit the generation of energy, and the low levels of energy inhibit the calcium pump. The end result? The mitochondrion, the powerhouse of the cell and the entire body, becomes calcified. This is the beginning of aging. It all starts in the cell. First the cells age. This leads to organ aging. And after the organs age, individual aging occurs. Since calcium is readily accumulated by mitochondria, this ion is potentially capable of antagonizing the activating influence of magnesium on many intramitochondrial enzyme reactions. This means that every function of your body can be inhibited when the mitochondria calcify. It's like going through life with the emergency brakes on. Calcium is the brake. Magnesium is the accelerator. What happens when a person exercises? While exercising muscles generate acids including lactic acid. During sustained hard exercise, some of these acids may be metabolized by the body but excess acid starts to accumulate near its source; e.g. in the muscles. As the concentration of acid increases, the pH drops in that area. This suppressed pH is called “exercise acidosis”. As blood pH drops the red cells tend to stick together forming Rouleaux chains, blood become more viscous, and blood pressure increases. Oxygen exchange decreases negatively affecting the VO2 max. Localized reduced blood pH triggers a gradual shutdown of transport mechanisms into and out of the affected muscle cells. The acid sensors in the cells are triggered and send a pain message to the central nervous system. This is “the burn”. There is acid damage occurring in those cells at this point. As the pH continues to drop, the blood may have to activate its emergency buffers of extracting calcium from the bones and/or catabolizing ammonia from muscle’s amino acids (muscle wasting) to maintain its pH at a safe level. Reduced transport cuts off fuel (glycogen) supply and inhibits both calcium ion exchange and waste removal. As a person uses up their body’s stores of glycogen, the brain functions begin to slow down (glycogen is the main fuel for the brain). Then the muscles tire very rapidly and stop functioning. This is sometimes called “bonking” or “hitting the wall”. Reducing one’s effort or stopping before one hits the wall may allow the body to catch up with fuel/waste removal cycle. When a person hits the wall, muscles stop operating and may result in collapse. This can be a health issue and you may also be severely dehydrated since even cellular water transport is inhibited. An intravenous injection may be required to replace the plasma liquid and glycogen. As blood flow continues it gradually carries the waste and acid to the kidneys for removal. When the transport into cells is restored, a person can rehydrate, refuel and return to activity. The recovery takes time. Delayed onset of muscle soreness (DOMS) and inflammation may occur during the next day or two as the body restores the micro damage to muscles. What does Hydrozone Magnesium-Bicarb alkalizer do for the athlete? Maintain the blood at the homeostasis pH level for longer times. Eliminate the blood from activating its emergency buffers. Keep the individual red blood cells flowing and exchanging oxygen. Keep the transport of waste and fuel moving in and out of working muscle cells. Reduce cardio-respiratory stress while operating at higher power outputs. Reduce the intensity of the burn. Allow longer use of fat, lactate, and glycogen as fuel to give sustained aerobic performance. Allow muscles to generate more anaerobic power when called for. Reduce damage to cells and accelerate healing muscles thus decreasing recovery time and DOMS. In conclusion this is an electrolyte replacement and is a buffer for the acid load in the body. By bringing our bodies back to acid-base homeostasis it allows a person to work harder and longer before reaching their limits. It represents a new health category called Systemic Alkalization. 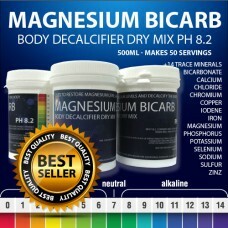 Among many positive results, the clinical trial* with Hydrozone Magnesium BiCarb demonstrated that optimal hydration with Hydrozone Magnesium BiCarb over three months may significantly increase blood magnesium levels, may significantly stabilise blood parathyroid hormone levels and may significantly increase blood albumin protein levels. These factors have been identified in independent international studies as factors that are significantly correlated to either decreased risk or increased survival of a range of serious diseases including ischaemic heart disease, stroke, osteoporosis, osteoarthritis, atherosclerosis ('hardening of the arteries'), breast cancer, other cancers and many of the debilitating diseases associated with ageing. The consumption of Hydrozone Magnesium BiCarb has been shown clinically to significantly improve sodium and potassium balance in the body. There is a significant improvement in body alkalinity. These results lay the foundations for peak fitness, increased cell function and improved health. 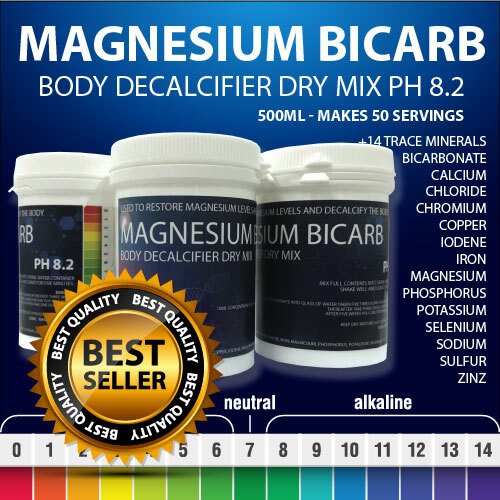 Many of the ‘magic’ and ‘miracle’ claims made by the media and Hydrozone Magnesium BiCarb consumers appear to have a firm medical and scientific basis. Hence, further clinical trials are being planned to assess the treatment of specific diseases and to assess improvements in athletic performance and stamina. * The clinical trial: Registered by the Australian Government Therapeutic Goods Administration (TGA). WHO Registry: ACTRN12609000863235. Double-blind, placebo controlled clinical trial with spring water containing added alkaline magnesium bicarbonate was conducted at St Vincent’s Hospital, Sydney, Australia. Note: The above report does not provide medical advice. Do not attempt self-diagnosis or self-medication based on our reports. Please consult your healthcare provider if you are interested in following up on the information presented. Legal Disclaimer The information and instructions do not constitute a recommendation to consume this water, and no claims of health benefits from consuming this water are made. Please also note that patients with kidney failure should not drink this supplement or consume any other kind of magnesium supplements without the express agreement of their physician.